'Start Here': Michael, Aetna-CVS merger. What you need to know to start your day. Yesterday, Hurricane Michael made landfall in Panama City Beach, Florida, as a Category 4 storm, leaving a trail of destruction and killing at least two. ABC News Senior Meteorologist Rob Marciano tells us that it will be a long cleanup process for many residents. Yesterday marked the worst day for Wall Street in eight months. The Dow Jones Industrial Average plunged 832 points, a 3 percent loss, at the close of trading, and the tech-heavy Nasdaq fell 316 points, or 4 percent. Among the reasons for the selloff were investors shedding tech stocks in recent days. Business Insider Senior Markets Reporter Joe Ciolli explains Wednesday's losses: "Tech stocks just aren't looking as unstoppable as they once did, and they're priced for perfection and really have nowhere to go but down." One is the country's largest pharmacy chain. The other is one of the biggest insurance companies. And yesterday, they won approval from the Justice Department to complete the biggest health insurance deal in history. For $69 billion, CVS will be allowed to merge with Aetna -- although there are a number of conditions. Beyond this deal, ABC News Deputy Political Director MaryAlice Parks said health care will be a big part of the midterm elections. It's still unclear what happened to Jamal Khashoggi, a U.S. resident and Saudi journalist for the Washington Post, after he walked into the Saudi consulate last week in Istanbul. His family members said they were told by Turkish officials he was murdered, but the Saudi government denies that. The Trump administration has avoided taking a side in his disappearance, despite Republican and Democratic lawmakers' voicing outrage over Khashoggi's case. Yesterday, the Senate Foreign Relations Committee took action, releasing a letter to prompt a White House investigation. "Republicans on Capitol Hill, who are normally very hesitant to criticize or condemn the Saudis, have said this could mark a breaking point in the U.S.-Saudi relationship," ABC News' Conor Finnegan, who covers the State Department, told us. 'I could say that I'm the most bullied person in the world': Melania Trump talks to Tom Llamas. 'I wouldn't say that Trump was a part of the hip-hop community. ... I would say that he got shout-outs': Rappers who once embraced Donald Trump ... aren't so much anymore. '... this was handled in the way that is consistent with their experience and the standard process': FBI Director Chris Wray defended his investigation specialists who looked into allegations against Brett Kavanaugh. 'A trophy is important, but clearly what matters most are the amazing memories from this incredible summer -- and no one can ever take those away': Authorities continue their search for the stolen Tour de France trophy. '... ridiculous lies and attacks because she can't defend her record ...': Backers of a Republican candidate fighting for Jeff Flake's Senate seat in Arizona distributed mailers that, when tilted, show a mushroom cloud enveloping Phoenix. Hurricane Michael, strongest US storm in 50 years, makes landfall: The monstrous Category 4 storm, with 155 mph winds, made landfall in the Florida Wednesday afternoon. T.I. gives a tour of his hometown: The rapper, who now goes by "Tip," took ABC News' "Nightline" to his old neighborhood in Atlanta and talked about giving back. Oct. 11, 1998 -- Gay teenager Matthew Shepard brutally killed in hate crime. 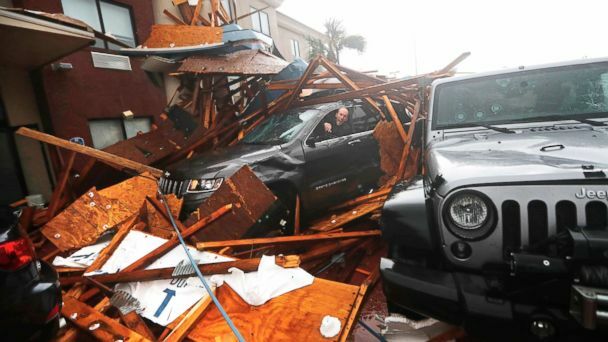 Structures were destroyed and streets were turned into rivers in Mexico Beach, Florida, where Hurricane Michael made landfall as an extremely powerful Category 4 storm.